I finally gave in and tried false lashes for the first time… I chose the “Gracie” lashes from The Vintage Cosmetic Company, so now I want to share my thoughts with you guys! Falsies have been on my To Try list for months, but I’m relatively low maintenance when it comes to my daily routine. I’ve always been nervous that it would be too hard or look to obvious to add fake eyelashes to my makeup arsenal. I was browsing Marshall’s (shocker) and came across these lashes from The Vintage Cosmetic Company, the holiday packaging caught my eye. 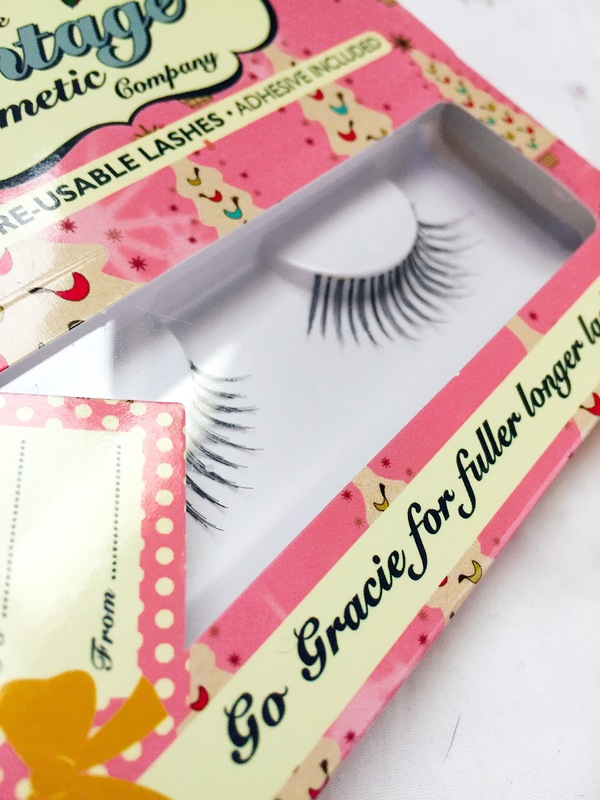 I love the vintage appeal of their line of false eyelashes but I ultimately settled for the natural look of the Gracie lashes. I love that they have an almost invisible strip and favor length over fullness. I really wanted to go for that super long lashes + clean matte eye look I’ve been admiring on Pinterest and Instagram as of late. Bonuses for me were that they include the eyelash adhesive glue and are reusable so I snagged a package for only $3.99! They sat on my bathroom counter for a couple days until I gave in and did full makeup on one of my free days just so I could test these puppies out. I applied my full eye makeup and everything as normal, keeping my gel eyeliner close to my lash line, curling my lashes and then applying one coat of Smashbox Full Exposure mascara. I trimmed three “sections” (or clusters on the Gracie style) of lashes at the end of both false lash strips to fit my eyes better. I made sure not to touch the strip that faces the inside of my eyes so they blend in, only trim the side of the strip that will go on the outer edge of your eye. The glue included is easy to use, and holding the Vintage Cosmetic Co. lashes with a pair of tweezers, I gently applied a thin coat of the white glue to the strip of the false lashes. I waited 20 seconds for the glue to dry to a tacky consistency and then carefully placed the lashed right above my natural lash line and pushed them into place using gentle pressure with the tweezers first and then with my pointer finger and thumb for extra security. The glue dries clear, so no worries if you get a bit messy, just make sure to apply the minimum you think you need to adhere the lashes! I didn’t need to apply anymore mascara, th Gracie lashes blend seamlessly with my natural lashes and add the perfect amount of length to make my eyes pop and look more awake. So although my initial expectation was that my makeup routine would take longer by adding false lashes to the mix, the results were that I had to apply less product to get the effect that I wanted with my eye makeup and was more satisfied with my makeup look than I would be without applying the Vintage Cosmetic Co. lashes. These Vintage Cosmetic Company false lashes were easy to apply for a beginner. The delicate Gracie style was perfect for going both glam or au natural because of the spacing of the lashes and the invisible strip. What are your opinions on false lashes? Do you wear them everyday or for special occasions only? Have you tried any of the Vintage Cosmetic Company lashes? Let me know in the comments! And don’t forget to follow my blog for more beauty and style posts!